Amazon surprised us all back in September when they announced not just the Kindle Fire but 2 ereaders as well. 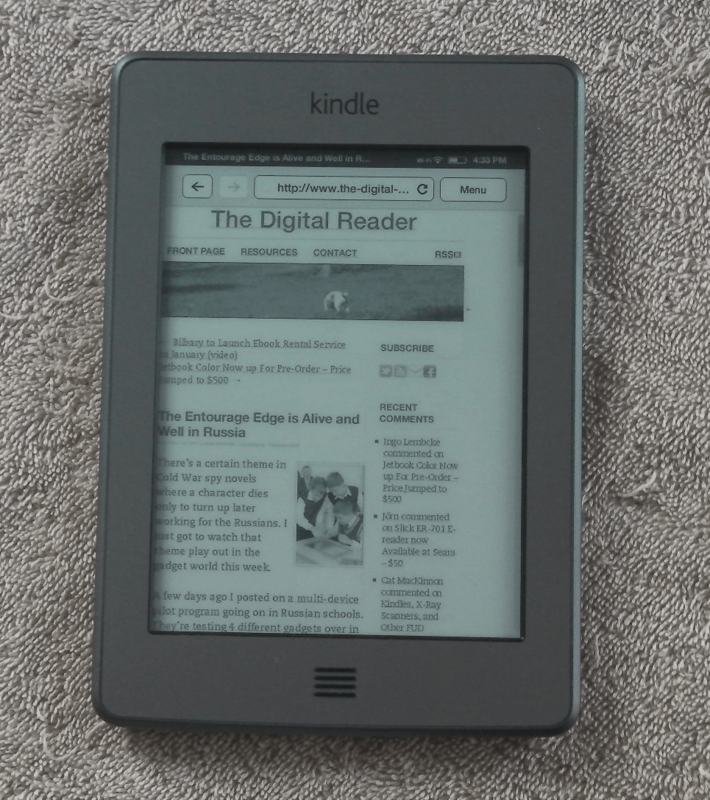 The K5 looks like it is going to be Amazon's premium ereader from here on out. It ships with the latest Pearl E-ink screen and a touchscreen based on Neonode's infrared technology. It doesn't have a card slot, so you're limited to just the 3GB or so of onboard storage (as well as the 5GB available online in the Kindle Cloud). Update: I just got sniped at in the comments because I'm calling this Kindle the K5. Well, it's running Kindle OS5, while the K4 (or Kindle basic) is running Kindle OS4. That is a valid reason to call it the K5, IMO. It comes with most of the latest software features, but it lacks the language support found on the K4 and it also lacks the ability browse the web over the 3G connection. That 3G web browsing is only available on earlier Kindle models like the K3, Kindle DX, K2, and so on. 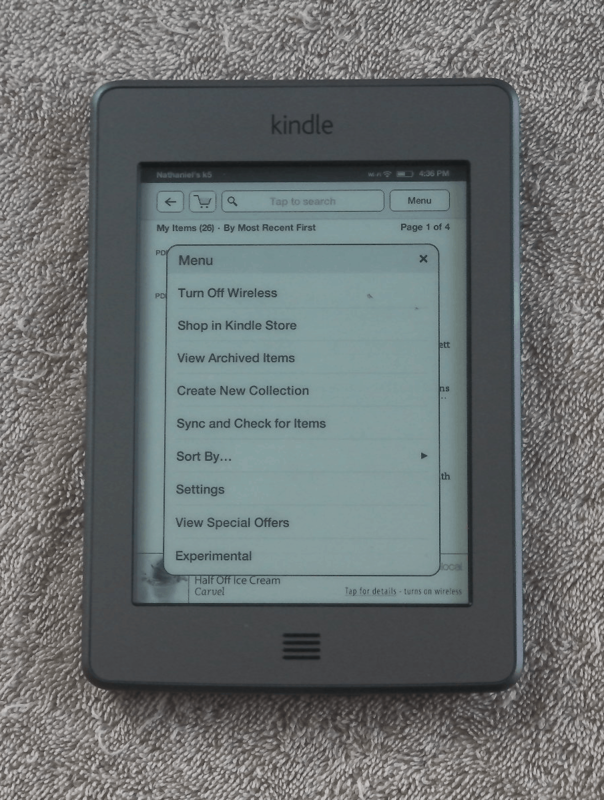 At first glance Amazon 5th 6" ereader is a rather hefty alternative to the basic K4. 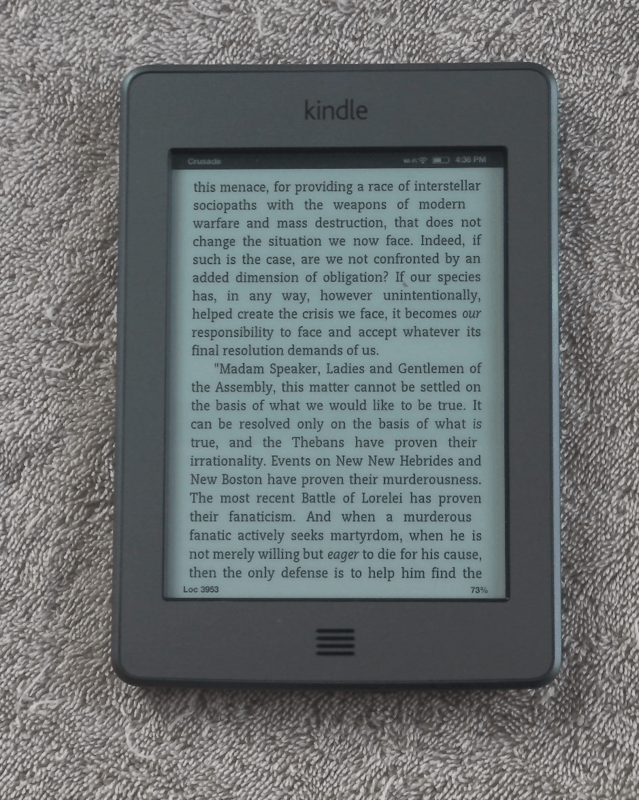 But while it is heavier than a number of other ereaders on the market it is also fractionally lighter than its predecessor, the K3 (according to Amazon's specs). It has a wide bezel around the screen with just the one button below. The back is nicely curved, with 2 speakers on the lower edge. On the bottom edge is the USB, power button, and headphone jack. I found the K5 easy to use with either hand. The touchscreen is divided so that a strip on the left side goes back, a strip at the top opens the menu, and tapping on the rest of the screen will turn the page. While I've heard some complaints about the K5 not being a one handed ereader, I don't see what the issue is. Yes, certain activities like looking up a word or navigating a menu works better with both hands, I can still read one handed. The K5 features new menus that were designed for the touchscreen, but the design is confusing and takes some time to understand. For example, I kept clicking on the home button because I thought it would open a menu while in an ebook. I know it's a home button, yes, but I was instinctively thinking of it as a menu button. And I've heard one or 2 complaints about the page turns. Like I described above, Amazon divided the screen so most of it is reserved for the next page button. But the only reason I knew that is because I was careful to ay attention during setup. If you don't notice the instructions then it would be easy to be frustrated by the odd behavior. Aside from the new menus, I believe the K5 is using the same reading app as the K3. It has the same 8 font sizes and 3 font faces, as well as the same options for words per line and line spacing. It also has the same PDF and text to speech support. It has the same annotation options, only instead of typing notes on a physical keyboard the K5 has an onscreen KB. I thought it worked pretty well. I almost never hit the wrong key and the K5 always kept up with my typing speed. You can search for a word either in the dictionary, Wikipedia, or Google by tapping and holding on the word onscreen. The K5 can also show you the popular highlights and let you share excerpts via Twitter or Facebook. But before you can share you'll need to crosslink your accounts. Update: No it does not. The K5 also has a new feature called Xray. This offers background material on books sold by Amazon, and the content is pulled from the user generated articles on Shelfari. It's quite fascinating, but not much use for me. Most of my ebooks are from elsewhere. The K5 appears to be using a new PDF app, and it works well. It uses the same page turn options as the other reading app, which is good. And the zoom settings are gone; you now use the touchscreen to pinch zoom and scroll around the page. You can also use the touchscreen to highlight and add notes. The PDF app is awesome, actually. You're still reading on a 6" screen and there's no reflow mode, but the PDF is one of the high points for the K5. The K5 web browser lacks the zoom settings found on the K4 and K3, but it replaces them with a pinch zoom. That's nice, but it's off set by several other issues. I don't think it's using quite the same web browser, and I don't like the changes. The browser is set to always crop the left margin, no matter the zoom setting. This means the text is close to the left edge of the screen. The left margin is far too narrow to be read comfortably on some websites, and there is no way to zoom out and make the margin a little wider. But the web browser did keep the article mode found in the earlier browsers (a viewing option that lets you reflow the text so it can be read comfortably). This means that the browser is not a complete loss. You can still read web pages; it's just not terribly convenient. I've also had trouble loading a number of the bookmarked websites (BBC, Yahoo). I know my connection is fast enough, so I have to wonder if the K5 just isn't up to the task. And I have to say that the K5 is rather slow to respond to swipes and zooming. This is probably just a software issue, but Amazon really needs to speed this . The K5 is noticeably slower to respond than my Sony Reader Wifi. I said in my first impressions post that I liked a number of the games on the K5. This is indeed where it shines. There are a number of the Kindle games that are quite fun, and I do like how Amazon lets games use the swipe to scroll the screen as well as the inch zoom option. In particular, I like games like Mahjong Solitaire. This is a game best played with a mouse, and that's why it works better with a touchscreen than with the d-pad (on the K3 and K4). Unfortunately, not all the games work. It's best to check to see if the game is compatible before you buy it. But that is easy to do. 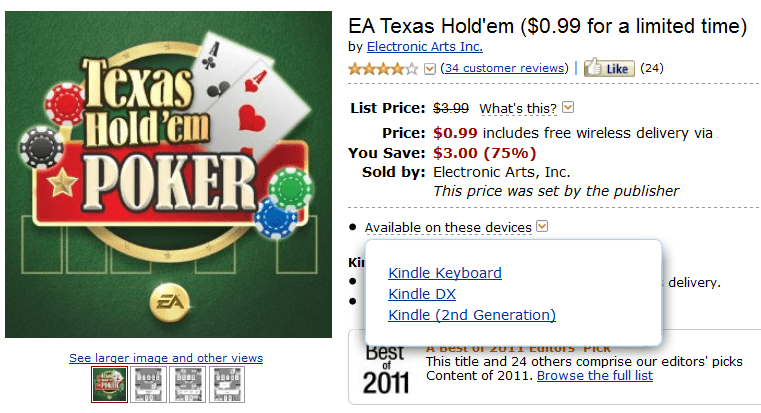 As you can see in the screenshot at right, Amazon tracks apps based on their compatibility with specific Kindles. This is a nice ereader, but it still has tradeoffs. If you buy it you should first weigh what it loses vs what it gains. For example, it has more storage than the K4, but it lacks the language support. It has a touchscreen, but it loses the keyboard and the 3G web browsing found on the K3. And the web browser gains some features but also loses others. But it is a well functioning device, and it's a solid middle of the road ereader. While it's not the best ereader on the market, it's also not the worst. I haven't found any worrisome signs that might turn me against the device (like the touchscreen issues on the Kobo Touch). All in all, I have to say that the touchscreen is what makes the K5 worthwhile. Between PDFs, reading, games, and the web browser, Amazon actually put a fair amount of work into integrating the touchscreen. It's much more useful than I expected going in. The Kindle Touch is a K4. Time to unsubscribe to your blog since you don’t know what you’re talking about! Actually, the Kindle Touch is running on Kindle OS5, while the K4 is running on Kindle OS4. So they are clearly not both K4s. And I only started calling this model the K5 when I learned about the difference in the software. To be honest, I think Amazon decided to launch their 4th and 5th gen Kindles at the same time. That would explain the differences in the OS. Why would Amazon have different OS numbering for a same generation product? That would be like calling a Mustang by two different names just because there’s a V6 and V8 models. Because one has a touchscreen and the other does not. They are very different devices with radically different interfaces that just happened to have been announced on the same day. They’re not same OS generation products, they just happened to be *announced* the same day. So they held back the K4, maybe redesigned the hardware for extreme low cost, and started working the Kindle Touch. End result: a very polished entry-level K4 and a not-as-polished K5/Touch. Put another way: the K4 should’ve come out in August and K5 should’ve come in March. One was held back, the other rushed. I expect future firmware updates will bring the K5 feature set and polish up to K3/K4 standards by spring. Unless they’re too busy polishing up the also-rushed FIRE. In truth, Amazon is now maintaining *three* separate Kindle OSes. It’s 4 OSes, actually. The K3 will likely also get updates. And I think you’re right about the K4 originally being intended to supplement the K3. It’s far too similar to be a coincidence. Another con: no horizontal view, very useful to see pdf in other kindles. Greeting from Poland as you’ve just recently acquired one new subsciber:) Brilliant blog! I have a question. You’ve wrote “(…) it’s a solid middle of the road e-reader. While it’s not the best e-reader on the market, it’s also not the worst. ” You seem to play with a lot of e-readers. Which 3 do you think are best on the market right now? I think the Nook Touch and the Sony Reader Wifi both beat the Kindle touch. They both run Android and after hacking them you can install the Kindle app. The Sony Reader beats the K5 on features and better software while the Nook Touch beats the K5 on price. Do you happen to have the lighted cover? I am generally very happy with my new KT. I don’t browse the web with it; I play a few games, but mostly I just read books and a few fiction magazines. My big worry was losing one-handed reading with the touch screen, but that actually works fine. The KT lighted cover fits differently from the K3, which used hooks on the side of the Kindle to both hold the Kindle in place and connect the light in the cover to the Kindle’s battery. They changed that design and now the KT fits in the lighted cover really snugly, so that two contact points on the back of it connect the light to the battery. The problem is, there is no good way to get the Kindle Touch OUT of the cover. I don’t understand why they didn’t put a notch or a hole in the cover so you could pop it out without the aid of a letter opener. When I don’t need the light, I prefer to read without the cover, as it make the KT heavier, but I am a little reluctant to pry the thing out for fear of breaking it. I detail what other features the KTouch (and KFire) have for fitting text to your screen in the font size you want to use. It’s an Android feature. Double-tapping, once your fonts are larger than fit the screen, will reflow it all *at that size* for easy reading. Double tapping on a PDF will fit a PDF column to the width of the screen. And of course a one-column piece too. You still have the flexible pinch-zoom. The blog entry is written for your average Kindle user, as I don’t think it’s very clear for many people how to use the KTouch right away and they’ve changed the processes so much from OS 3 and 4 , that one web-news reviewer hated that they changed where everything was and had optimized it for touch methods and he begged everyone not to buy one. But he was overreacting to change. I agree though that it’s not intuitive, to begin, but I’ve come to like this better now than my K3 Keyboard though I can type accurately w/ no prob on my K3 but not on most small touch systems… Still, I’m used to going faster on keyboards and you can’t with the careful placement of fingers on virtual keyboard. Using a Samsung Galaxy 10.1″ Tab lately (that I got on Woot! (best buy I ever made, at $320), I really like the Thumb Keyboard, which I also use on my Samsung Galaxy S2 — it’s a really smart keyboard though you have to get used to why the split works as it does. The split works for smaller keyboards and different ways for larger ones with alpha keys to the edges so the hands don’t have to stretch. In comparing e-readers, I’ve been frustrated that my Nook Color doesn’t do a thing with images in normal books. 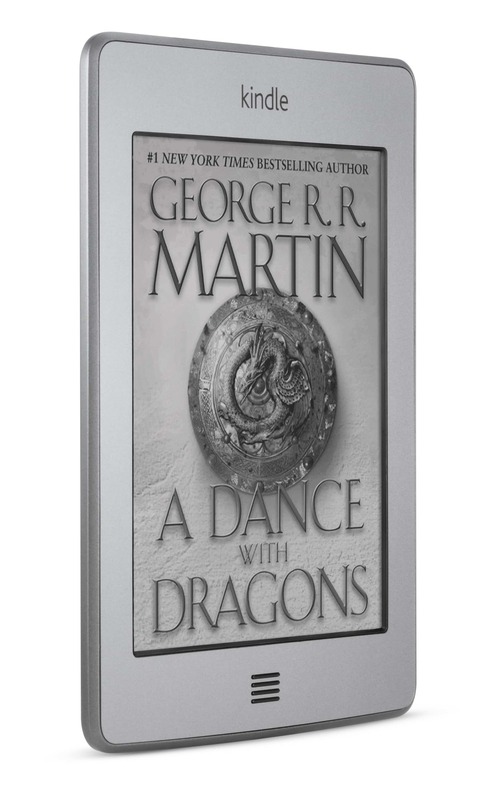 Amazon has always allowed you to make them full screen (useful if the pic is high-res enough) and to place them in landscape mode if that’s what the original pic is. Here’s what’s possible with all Kindles and then some extra niceness with the Kindle Fire when it comes to images in books.